De facto PEGIDA leader Lutz Bachmann is to step down from his post after a Facebook photo of the organizer looking remarkably like Nazi leader Adolf Hitler – toothbrush mustache, pursed lips and side-part included – was printed in a German tabloid. Co-organizer KathrinOertel confrimed Bachmann's resignation to Reuters. "Yes, I can confirm that Lutz Bachmann has offered his resignation and it was accepted," she said. 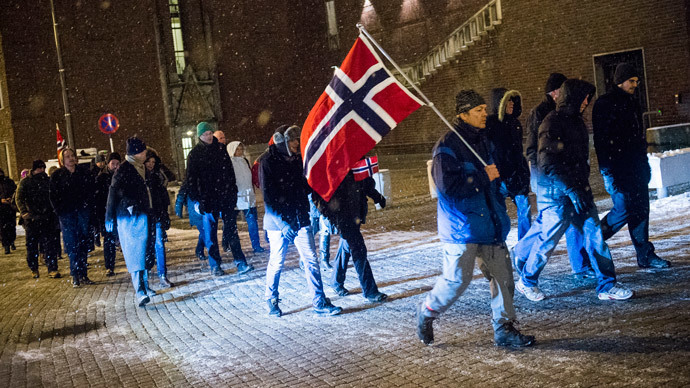 "PEGIDA will go on." The 41-year-old graphic designer rose to prominence as the most recognizable face of the Patriotic Europeans against the Islamization of the West (PEGIDA) movement, which started staging weekly anti-immigration marches throughout Germany in October. The picture, captioned “he’s back,” was released by the Dresdener Morgenpost (MoPo) Monday, but was reportedly originally posted to Facebook sometime last year. Bachmann, at first, defended the image, telling Germany’s Bild newspaper that the Hitler snap was an attempt at satire. The organizer claimed that he meant it as an homage to Christoph Maria Herbst, a comedian who voiced satirical audiobook, ‘He’s Back’, written by Timur Vermes about Hitler’s return to Earth. “There's no dealing with something like that. This is about an entire movement and not just one person,” group organizer Rene Jahn was quoted in Deutsche Welle as saying. 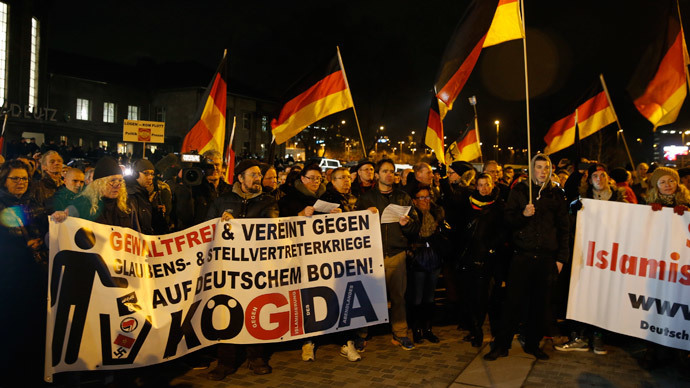 PEGIDA has issued a rallying cry to curb immigration, though it has attempted to distance itself from far right extremists saying in its mission statement that they welcome asylum seekers fleeing political and religious persecution. 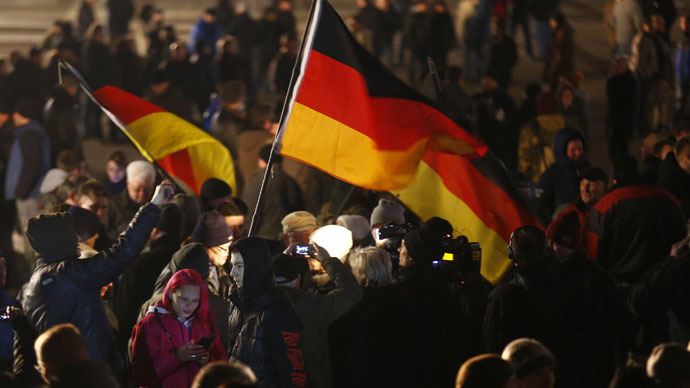 However, the group has still been criticized for intolerance and Islamophobia, and their marches have been met with even larger counter protests across Germany. 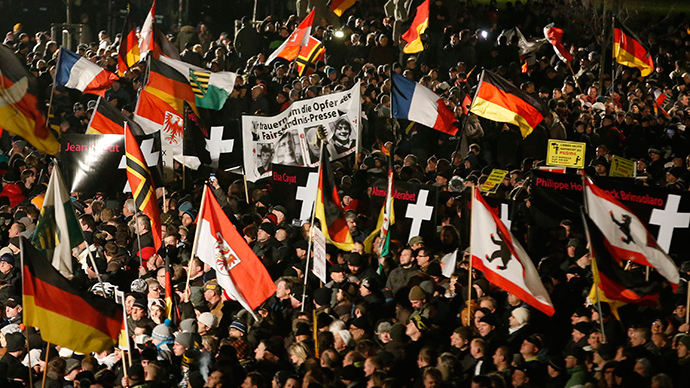 On Monday, authorities canceled a PEGIDA march in Dresden, citing a “credible” jihadist threat on Bachmann’s life. He is currently under police protection. 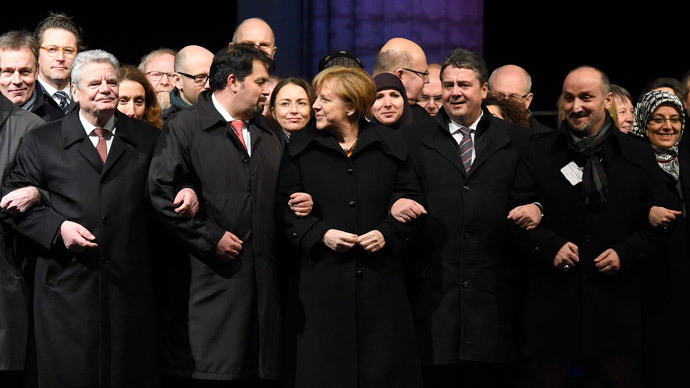 Even Chancellor Angela Merkel who has repeatedly condemned the group came out in support of the groups right to march. “As Chancellor, regardless of whether I like the contents, I have an immediate interest in ensuring that there can be demonstrations in every place in Germany, because it is a fundamental right,” she said. Another rally is set to take place Wednesday evening. LEGIDA, the group’s Leipzig affiliate, expects between 30,000 and 40,000 protesters to take to the streets. In response to the planned rally, nineteen counter-protests have also been scheduled.